Fassinating Fassbender - A Michael Fassbender Fan Blog: Fassinating Changes Coming! Michael won an IFTA this weekend! 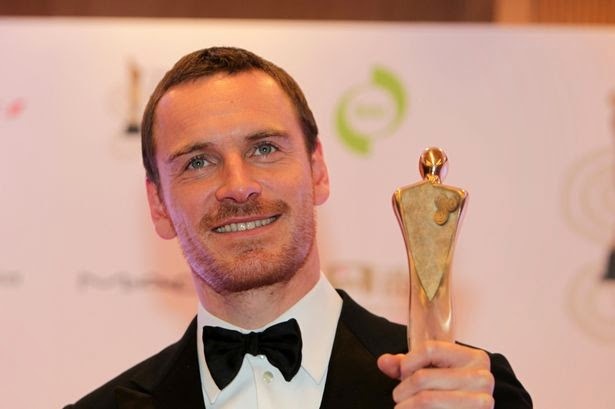 You wouldn't know that Michael Fassbender won an award this past weekend. Why? Well, "sources said" crap rumors took precedence because it got gossipers to do what they do best: sit and gossip. Regardless of how asinine and unbelievable the rumor is, the lowest common denominator of public opinion took front stage and spoon fed them exactly what they wanted to hear. As usual, nothing good comes from this type of gossip because the nastiest and most disrespectful commentary about Michael, either in jest or really designed to slam him, was all over the net yesterday. It was intolerable to read, and there's nothing a sensible fan can do about it. A voice of reason has no weight in the topic regarding Michael's private life. It's quite pathetic, but, the timing is ripe for this stuff to begin. And this is a perfect segway to inform you that I'm finally going to revamp the blog a bit. Hupsakeek worked very hard last Fall in taking a logo concept I had and modified it into something quite nice. Since 2008, the blog has received several makeovers, with the current theme being it's best one yet. But I'm looking forward to brightening things up a bit here, and branding our new logo design and community motto "No gossip, just The Fass". The benefit of having this blog via Google blogger is that they have some template themes where I can just plug in a few things and voila! But this time, I'm going for a more professional look. A properly original designed banner, an original motto, and a white background for the blog articles (for easier reading). We have a few more tweaks to make and I hope to unveil it sometime this week. Awesome. Looking forward to it. I love to tweak. Very good idea, I can't wait to see the new look of the blog and I love the new comunity motto. Have a good tuesday Fassinators !